To celebrate National Barbecue Month, we recently invited you via social media to share with us your favorite organized barbecue festivals, contests, and cookouts. Thanks to you, we learned about events from the Carolinas to California, from Texas to Tennessee. All summer long, amateur and professional pit masters will be cooking up a storm, barbecuing ribs, brats, brisket, chicken, and more. Hopefully, a cloud of blue smoke will be settling over your town in the weeks to come. Check out the list we compiled from your suggestions. And if we missed anything important, let us know! As the place where the Carolinas come together, Carowinds knows a thing or two about having a good time. Now you can get a taste of the best food, entertainment, and culture from seven different regions all around the Carolinas, all in one day! You can also ride Fury 235—the world’s tallest and fastest giga-coaster. The park is holding a summer kick-off party, where locals can enjoy gourmet food and handcrafted beverages, homemade arts and crafts, first-rate entertainment from seven distinct cultures from North and South Carolina, including Asheville and the mountains, Outer Banks, and Lexington, Upstate SC, BBQ region, Lowcountry SC, and Charleston. Looking to give your taste buds a head start before July? Check out Worlds of Fun’s third annual BBQ & Brew Fest. Guests at Kansas City’s beloved theme park will enjoy craft beers from around the region and tasty barbecue! Don’t forget to check out park attractions such as Mustang Runner and Falcons Flight—be sure to leave your BBQ sauce on the side. Come get BBQ’D at the Memphis in May Festival, one of America’s most prestigious barbecue cooking competitions and one that is bound to give you the most smoke-filled weekend of your life. Also hosting some of the cities largest events—like the Beale Street Music Festival and the World Championship Barbecue Cooking Contest—this festival brings the world to Memphis and Memphis to the world. To the Non-Eggheads out there, an Eggfest is a gathering of Big Green Egg fans and experienced cooks showcasing their skills and talents by preparing specialty recipes all festival-long. Stroll around the Georgia Mountain Fairgrounds and get close with the cooks by talking to them about their recipes and techniques while sampling their wonderful ‘Egged’ food. Two full days of live music, delicious food on sale from the BBQ pros, beer and wine, children’s activities, grilling demos, and so much more—you can’t go wrong at the Madison Magazine BBQ Festival. Financial proceeds go towards supporting the arts, young professionals and youth in the Sauk Prairie Community. Partnering with Susan G. Komen Race for the Cure and raising funds for Phoenix Philosophies to build homes for homeless veterans, the Salt City BBQ Festival includes a professional cook-off with teams from across the country competing for cash and prizes and selling their BBQ to attendees. Let the kids get in on the action in the Kids’ Q Cook-off. Come down to the New York State Fairgrounds, eat some awesome BBQ, drink some beer, listen to some great live music, and help a great cause. 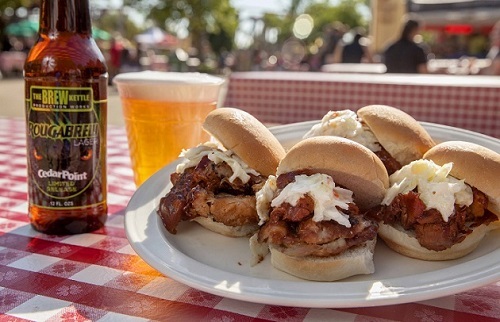 Sample more than 100 microbrews and mouthwatering BBQ at the “Roller Coaster Capital of the World.” Brew and BBQ is back for the third year at Cedar Point and better than ever! Venture to Sandusky to enjoy BBQ dishes from premier chefs and live entertainment while savoring some of the best craft beer from around the country; including six exclusive Cedar Point beers! Brew and BBQ takes place in FrontierTown, so grab your friends and make sure you come hungry and thirsty! And if you’re looking for big thrills to match your big BBQ plate, the Valravn – the longest, tallest dive coaster in the world—won’t disappoint. Kick off your Memorial Day weekend with a celebration of regional micro brews, Bay Area wines, inspiring food, local bands and unique live entertainment, including dueling pianos. Red, White & Brews will entertain guests under some of America’s greatest coasters, including Patriot—the first floorless coaster in the park’s 41-year history. Holy Smoke has been perfected and the barbecue at Stomp n’ Holler is nearly a religious experience. Dish up some mouth-watering barbecue from more than 10 members of the Texas Pantheon of Pitmasters, sit back with a cold Shiner (the #1 craft brew in Texas), and enjoy the astounding musical energy of Grammy Award-Winning Band, The Mavericks. Killer ‘que surrounded by skyscrapers? Live music? Cold beer? 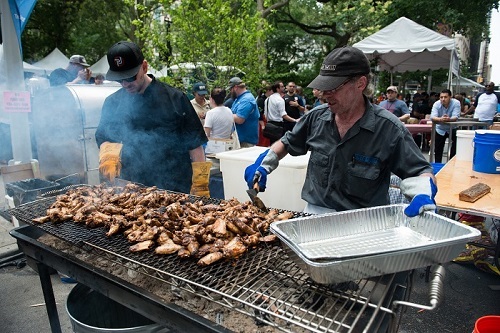 Manhattan may not be the first place you think of when it comes to barbecue, but head over to Madison Square for this over-the-top, forever memorable block party where the country’s top pitmasters serve-up their specialties. Located on Ontario’s most popular festival street -Sparks Street- the Ottawa Ribfest serves up some spectacular BBQ chicken and ribs. 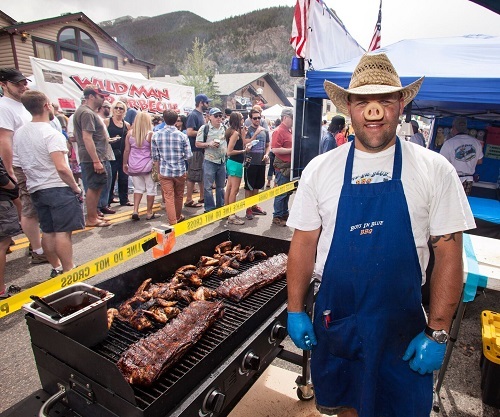 Colorado’s longest-running barbecue competition, the Colorado BBQ Challenge is a multi-day event featuring live music, pig races, kids’ activities, a firefighter cook-off, chef demos, a Breckenridge Distillery Whiskey tour, the Bacon Burner 6k and some of the best barbecue in the nation. A Kansas City Barbeque Society (KCBS)-sanctioned competition, The Colorado BBQ Challenge attracts an elite group of pit masters each year; winning the Colorado BBQ Challenge provides eligibility to compete in the American Royal – the “World Series” of barbecue. More than 70 barbecue masters will travel to Frisco for the two-day competition, that draws more than 30,000 attendees annually, to test their skills in a variety of categories, including pork, ribs, chicken, brisket, barbecue sauce, side dish and more. Event-goers also have the opportunity to support local nonprofits such as Advocates for Victims of Assault, the Summit County Restaurant Association, High Country Conservation Center, Mountain Mentors, Women of the Summit and the Summit Chamber. Hosted at the riverside McGrath Amphitheater, the Cedar Rapids BBQ Roundup brings together teams from around the country to dish up BBQ and compete in categories of ‘Best BBQ Ribs,’ ‘Best Pork BBQ,’ ‘People’s Choice,’ and more. The festival also features live music from local artists and bands and other entertainments that are perfect for the whole family. What better place to enjoy classic American barbecue than in the country’s capitol?! Vendors, chefs, and competitors from across the country go head-to-head while attendees enjoy tastings, live music, and demonstrations by chefs and cookbook authors. Celebrate an all-American holiday like the Fourth of July with some all-American barbecue. The Lake Placid, NY I Love Barbecue Festival’s main event showcases a KCBS sanctioned barbecue competition, although guests can also be entertained by live bands and a motorcycle parade. Voted Wausau’s Favorite Event five years in a row, the Balloon & Rib Fest has something for everyone—animals, bounce houses, hot air balloons, 6 Rib Vendors and other fantastic foods, kites, and the largest fireworks show in the region. This annual fest in Virginia is sure to leave your mouth watering with Moonshine pork sliders, loaded tater tots, BBQ chicken tacos, drinks from local breweries, and more. Food for this year’s BBQ & Brew will be set up along Candy Apple Grove and provided by both the park’s executive chef and local restaurants. Make sure you check out new park attractions such as Flight of Fear, Dominator, and new Planet Snoopy expansion before you eat! Started in 2001 as a blues concert and barbecue cook-off for only a handful of amateur grillers, Pigs & Peaches is now a two-day festival of non-stop music, good eats by competitive cook teams, cold beer, and interactive family-fun. This one-day festival and charity fundraiser is making its twelfth year the biggest and best yet with a morning BrewBQ Bike Ride, BBQ vendors who bring delicious new flavors to the menu selection, a Craft Brew Zone featuring over 75 craft brews, and live music you can enjoy from the comfort of your lawn chair or blanket. 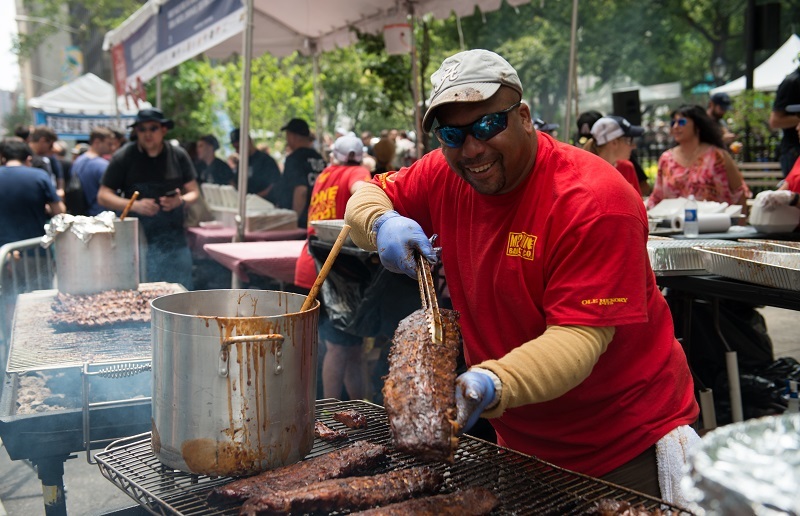 One of America’s biggest and best free-entry barbecue festivals, The Best in the West Nugget Rib Cook-Off hosts two dozen of the world’s top barbecue competitors to serve up more than 240,000 pounds of ribs for thousands of event attendees. Get ready for a smoky finish to summer. Head over to Kansas City for the American Royal World Series of Barbecue and you’ll experience the world’s largest barbecue competition, boasting of over 500 teams and 70,000 spectators. Held for the first time at the historic Wilderness Trail Distillery, this year’s KY State BBQ Festival features celebrity pitmasters and great music, food, beer, and bourbon—promising fun for the entire family. Bring the entire family to Downtown Tulsa for four days of live music and Oklahoma’s premiere celebration of award-winning ribs. Admission is free! For more than 50 years, Beef-a-Rama has been held on the last Saturday of September, with roasters cooking their signature beefs before dawn and more than 12,000 people filling the streets to enjoy it. This creative festival gives you many choices as a visitor—join the crowd and dress up in a cow-themed costume, participate in the 5K and 10K Rump Roast Run and Walk along Lake Minocqua, shop around the Prime Choice Craft show’s 70+ vendors, watch the Beef Eating Contest and the Cow Pie Plop and and the famous Roaster Parade—all culminating in a one-of-a kind fun you can only find in the Northwoods. This cook-off tests competitors skills in seven barbecuing categories: beef brisket, chicken, cook’s choice, dessert, Jack Daniel’s sauce, pork ribs, and pork shoulders/butts. Try this variety of classic barbecue alongside live music and clogging performances—the traditional dance of the Appalachian region.